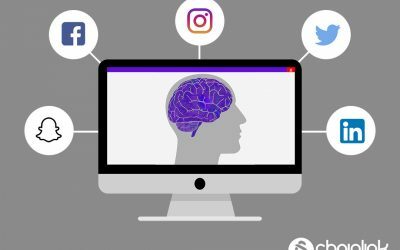 Social media analytics are empowering individuals and businesses to make the best marketing decisions possible. Digital marketers spend an inordinate amount of time analyzing data to maximize their campaigns. Let’s focus on Twitter. With so much information available, knowing which metrics to consider and which to prioritize can get frustrating. 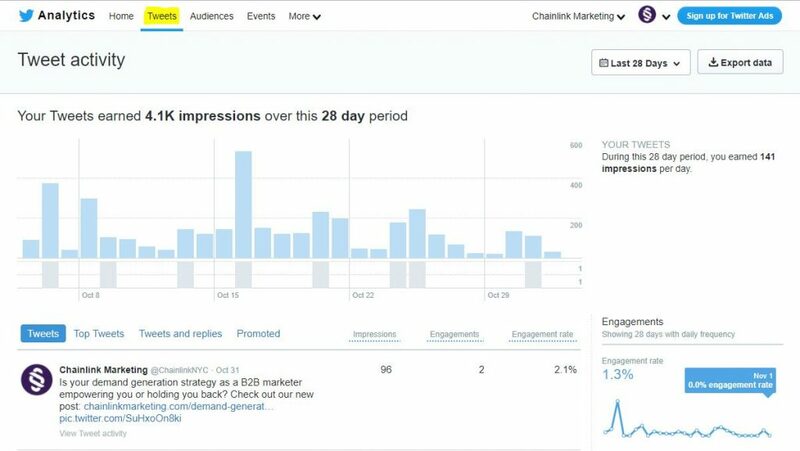 Most business owners and marketing teams are at least familiar with their Twitter Analytics homepage, but chances are they are not using their account metrics to their full potential. Whether you’re new to the social media game or consider yourself a guru, you’ll want to read on. Brush up on your Twitter terms and let us help you remember what is most important: using metrics to boost your marketing efforts and business success. This analytics dashboard is integrated into the Twitter platform, and highlights key metrics in various different tabs. The Home tab and Tweets tab focus on different data measurement. The Home tab tells you your top tweet, top media tweet, top mention, and top follower. You’ll also see an overview of a 28-day summary showing how your number of tweets, tweet impressions, profile visits, mentions, and followers, and whether they have increased or decreased. The Tweets tab provides metrics for individual tweets. This includes tweet impressions, engagements, and engagement rate. The Audiences tab provides detailed information about your company’s followers (think information on demographics, lifestyle, and consumer behavior). 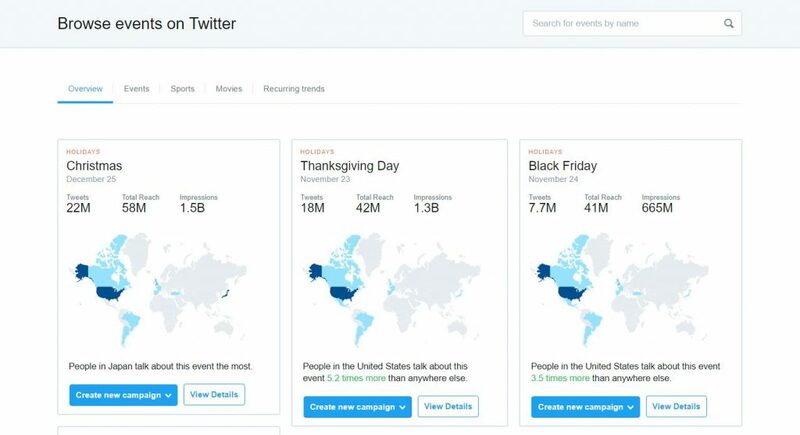 You can also compare your company’s followers’ information to all Twitter users’ in the US or your “organic audience”, which means users who have interacted with organic content belonging to the full promotable (primary) user of their Twitter Ads account. Now let’s break down how to use the Twitter’s metrics found in the Home and Tweets tabs in the most productive way for business accounts. The two main categories of metrics you should be following are your overall account metrics found in the Home tab and individual metrics in the Tweets tab. The account metrics found in the Home tab over a month-long period can provide you meaningful insights (if you know how to leverage them). 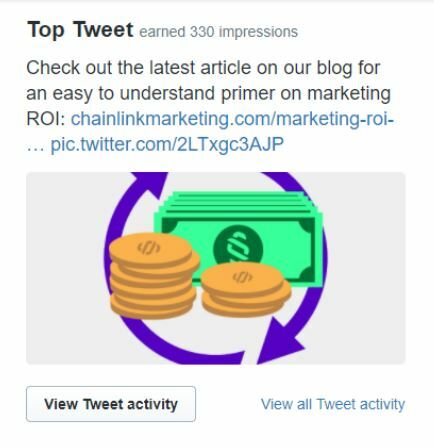 For example, the top tweet/top media tweet metrics determine the tweets with the most earned impressions for a month. 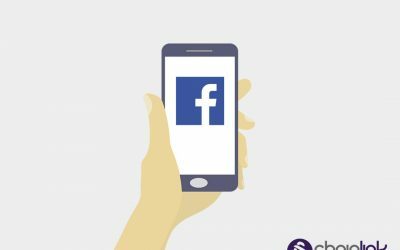 This way, you can quickly identify which one of your posts had the greatest reach for the month (which is an important record to track over time). Top mention: This metric measures the tweet with the most impressions in which another Twitter user mentions your username. It’s important because if you know the user who helped expand your reach, then you can follow up with them… perhaps seek out business opportunities and maybe start a campaign together. 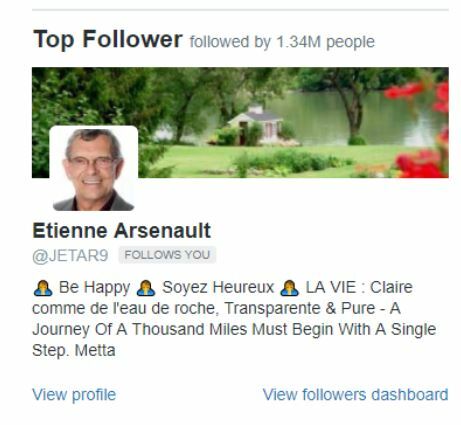 Top follower: This is your follower with the greatest number of followers of their own. Even though this user might not have shared your content yet, he or she is worth paying attention to. As a potential brand advocate or influencer, you’ll want to know who your top follower is. New followers: The number of new followers you’ve won in a month is critical for your marketing team to know. You can map any changes to your activities on Twitter to show how different content strategies affect your number of followers at large. Individual tweet metrics found in the Tweets tab are extremely valuable. We can break down individual tweet metrics into click statistics, engagement rate, number of retweets, and tweet reach percentage. Knowing how many people clicked on a photo, video, profile or link in a tweet is crucial when you want to know who is curious about your business. These are people you want to be targeting. Keep an eye out for clicks through to your website to measure how effective your posts are at driving traffic. Measuring engagement has to do with measuring the number of times users interacted with a tweet by retweeting, replying, following or liking. Once you’re cognizant of which tweets generate the most positive and robust user reactions, the more you can replicate those kinds of tweets. This way, you’ll know what works and what doesn’t work for your brand. Engagement rate is the number of engagements with a tweet divided by impressions. This rate is good to know to conceptualize the actual amount of engagement a certain tweet is attracting. 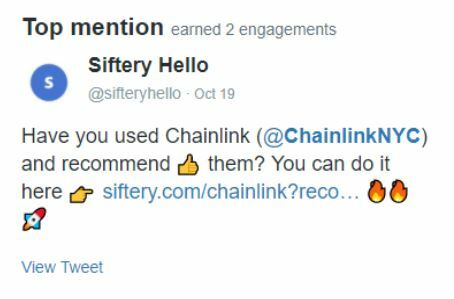 When you factor in how many users saw the tweet (impressions) you get a more complete look at your content’s effectiveness (or lack thereof). Track this metric overtime using a digital platform to see what people want to see. Tweet reach percentage is basically how many of your followers see a certain tweet. This is a super easy calculation (think tweet impressions divided by total followers). If you want to plan a strategy of reposting the same content in different ways to get the most exposure possible, this is a great metric to consider. Every company wants real-time data on their target audience. Trends in growth (or shrinking) of your current audience (your followers) will help you figure out how to use your insights to adjust for growth or retention. Demographics information such as age, gender, household income, languages, education level, and location and interests can show you how to tailor your content to appeal to your audience (which will make them want to engage more). Since our current audience right now is primarily American men ages 25-45 interested in technology, marketing, and entrepreneurship, my content creation strategy should follow suit. 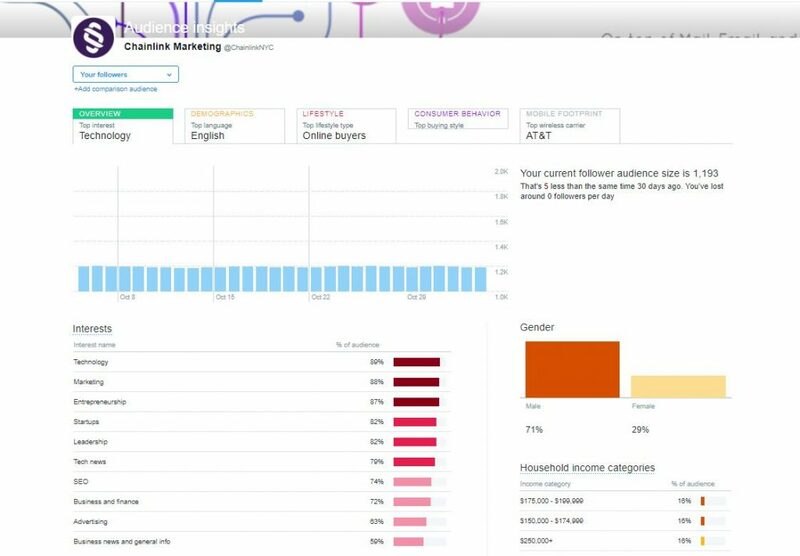 Arguably, the best part about Twitter Analytics is being able to compare demographics information of your current followers with the audience of your organic reach. You can determine how your organic audience is different from your current followers in regards to country or interests, and see where the gaps and outliers in this data may be. So, if our current followers are mostly based in the U.S., but our organic reach demographics indicate that we have a more globally diverse audience, this could be valuable information if we wanted to expand our services internationally. Quantifiable demonstrated interest in another part of the world could help justify your decision to offer services in that area. If you’re a brand with an e-commerce store that heavily relies on holiday sales, or thrives during the time period building up to a certain event, then analyzing event metrics is ideal for you. 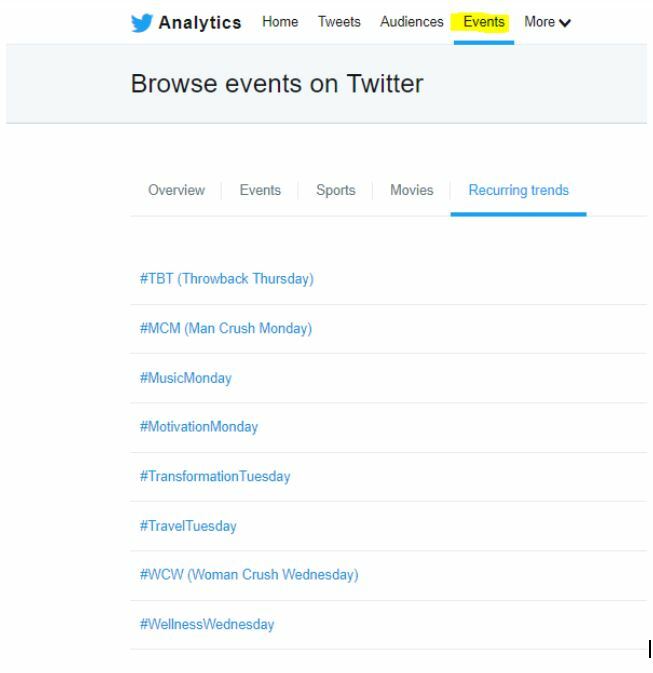 However, any company could benefit from educating itself on the number of tweets and impressions surrounding events, seasons, or even hashtags. Thankfully, Twitter provides an easy format to visualize geographic reach. For example, if you’re a fitness/health guru you’ll want to pay attention to the recurring trends surrounding #MotivationMonday, #TransformationTuesday, and #WellnessWednesday. 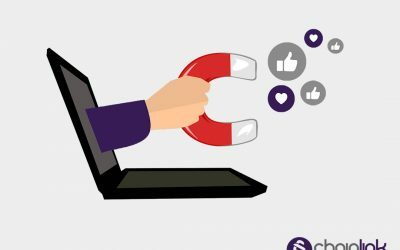 You want to attract new followers and ensure your current followers are engaging with you as much as possible. Twitter’s business blog has some great hashtag strategies that can help keep you on track. 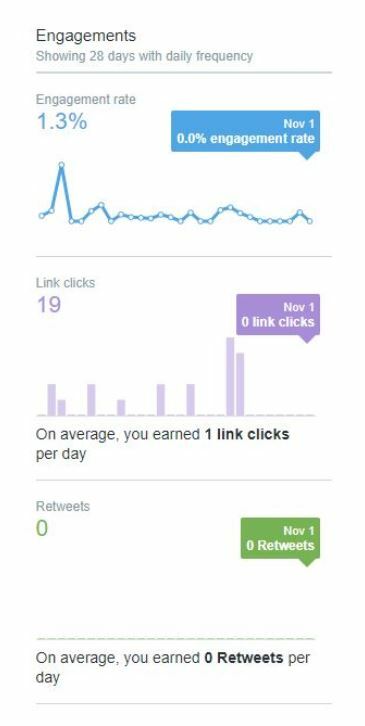 Twitter Analytics can’t just be about collecting data that you aren’t proactive about interpreting. You should always be analyzing and acting upon the data you gather in order to achieve your marketing goals. 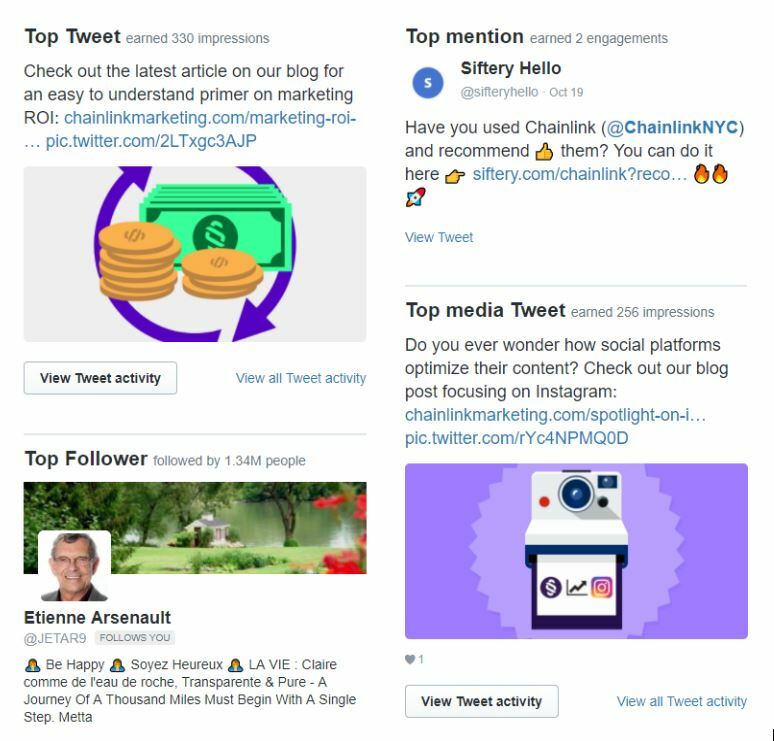 At Chainlink, we understand the importance of taking advantage of the wealth of information at your fingertips with your company’s Twitter Analytics. We know it can get overwhelming to sift through the multitude of data and decipher which metrics provide you with the most value. 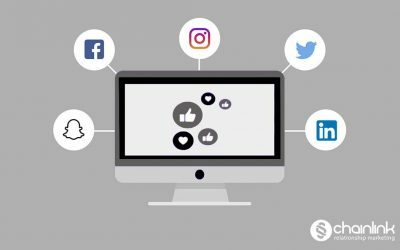 If you and your company want to integrate your social media marketing with your cross-channel efforts, we’re here to help you. 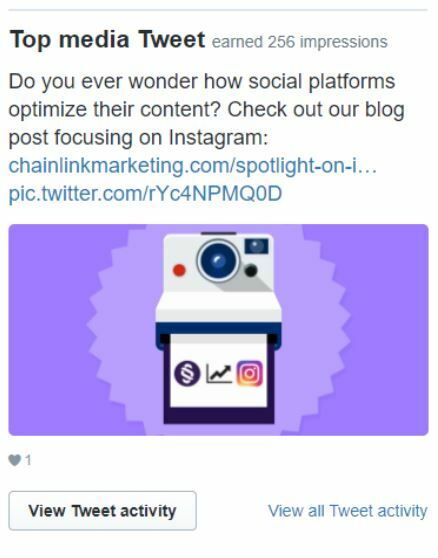 Also, our proprietary Chainlink Marketing Platform offers solutions that can help your business integrate social channel platforms and data with your marketing programs and workflows. We would be happy to manage your overall digital campaign using our proprietary platform, effectively applying our knowledge about social media marketing to ensure the best possible program. Check out our article featuring information about optimizing your business Instagram, too.